Hasrat Jaipuri gets Rajasthan Ratna Awards 2013. 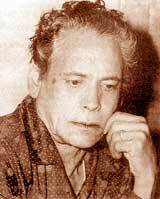 Hasrat Jaipuri (April 15, 1922 – September 17, 1999) was a Hindi and Urdu poet and film lyricist in Hindi films. Jaipuri was born in Jaipur, where he studied English till medium level, and then acquired his taalim in Urdu and Persian from his paternal grandfather, Fida Husain. Rajasthan Ratna awardees are given Rs 1 lakh as cash, a shawl and a citation by the stategovernor,chief minister and minister of art and culture.This award is on the lines of the highest civilian award Bharat Ratna that is conferred by the central govt of India.